Not only is container gardening a decorative approach to growing your own food in small spaces, it has many other benefits. Healthier Soil – If you live in an area with heavy clay or contaminated soil, you can choose clean, fertile potting soil for your container to meet the needs of specific plants you wish to grow. The Farm Tub system also allows intricate root systems to develop for healthier soil by eliminating compaction from top watering. Water – You can control the amount of water you use and in the case of Farm Tub planters, you can conserve water and reduce evaporation. Location – Containers allow you to test indoor and outdoor locations for the ultimate sunlight and relocate if necessary. This is also ideal if you wish to move your garden with you. 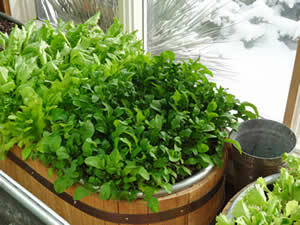 Weeding – Your weeding is very limited as weeds can’t migrate into your planters. Protection – Containers offer protection from burrowing critters. Learn more about Container Gardening from the CSU Extension.